Gotta make a move to a town that's right for me...Won't you take me to—Funky Town!" Everybody has their funky side. And no we don't mean the side that smells a little funky. We mean the side that wants to get up a do a funky dance step, groove to the music, and enjoys the energetic sounds of disco! Everybody wants to get up, and move. You have always had the funk bug. You've been doin' disco steps ever since your Grandpa taught them to you. Heck, you were even singing Play that Funky Music by Wild Cherry when you were in middle school. The other kids really seemed to like it, and soon enough, the whole lot of you were singing, "Yeah, they was dancin' and singin' and moving to the grooving, and just when it hit me somebody turned, around and shouted, Play that funky music white boy!" 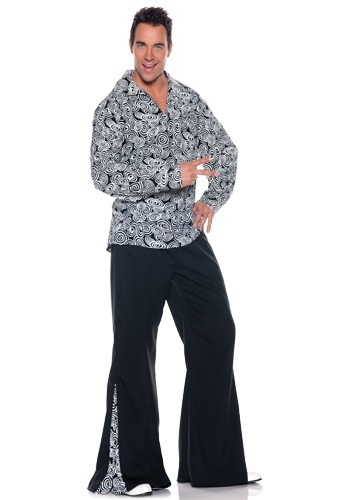 In this Funky Disco Costume you can return to your funky disco roots. Just put on these black flair pants, and the wing collared shirt, and grab yourself some roller-skates, and do the YMCA dance down the street. Or maybe you are more of a Hustle kind of guy. Either way, just like when you were in middle school, people will come out to do some funky dance moves with you too. Because, everybody has a funky side. You just got to show them the way to—Funky Town!